The Cuyahoga County Council voted 8-3 to pass a comprehensive countywide nondiscrimination ordinance protecting LGBTQ people from discrimination in housing, employment, and public accommodations on the evening of September 25, becoming Ohio’s largest municipality to offer such protections. Votes like tonight’s in Cuyahoga County contribute to the undeniable momentum surging forward toward a national law bringing LGBT nondiscrimination protections to every state, and at the federal level. In recent weeks we’ve seen a surge of activity at the local level pushing toward LGBTQ-inclusive nondiscrimination protections – and that’s because they know that the American people want the country to stand on the right side of history, protecting everyone. 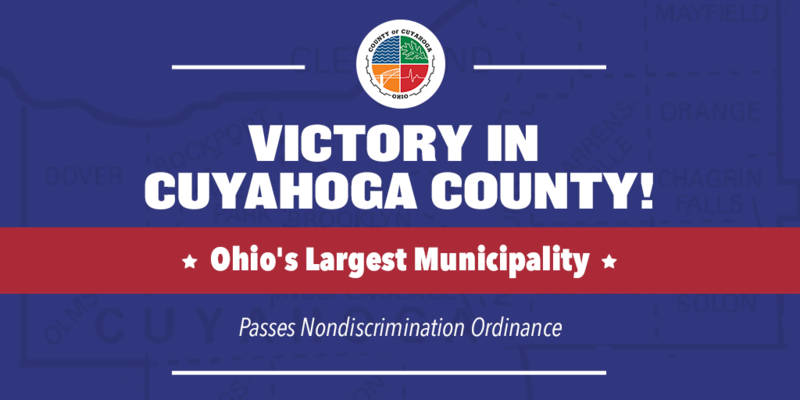 When municipalities – especially large ones like Cuyahoga County – embrace nondiscrimination protections that cover the LGBTQ community, they set an example for other cities and towns in their state – and, more broadly, the nation. Hundreds of cities and towns over the past 40 years have voted to protect residents from discrimination based on sexual orientation and gender identity, because they know it’s the right thing to do and that no one should face discrimination because of who they are or who they love. Equality Ohio has also been working tirelessly to pass a statewide nondiscrimination ordinance — Ohio is one of 31 states with no statewide protections. Earlier this year, House Bill 160, known as the Ohio Fairness Act, had its second hearing in the House, the first time this has occurred in the nearly 10 years since the bill’s initial introduction. The organization continues to meet with representatives and staff to shore up support and ensure passage. Congratulations to our friends and partners at Equality Ohio on this monumental victory! To learn more about Ohio’s history of nondiscrimination, click here. To show your support for nondiscrimination protections nationwide, sign our pledge.